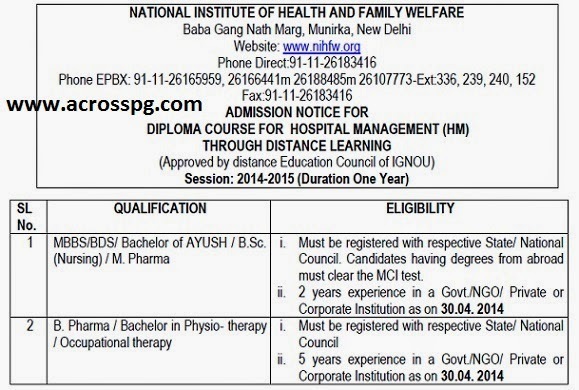 Diploma in Hospital Management 2014 - NIHFW - AcrossPG Exams! Prospectus can be download from website (http://www.nihfw.org/) which will be available from 1st March 2014. Kindly ensure that appropriate prospectus for each course should be downloaded at the time of apply. Prospectus can be obtained from Distance Learning Cell (Room No. 417) from 15th March 2014 by hand or by post sending with a Crossed Postal order/Bank draft for Rs. 200 in favour of the Director, NIHFW, payable at New Delhi. Last date of submission of completed application form is 31st May 2014. However, with late fee of Rs. 500/- in the form of demand draft in the favour of Dirctor, NIHFW may be submitted by 30th June 2014.